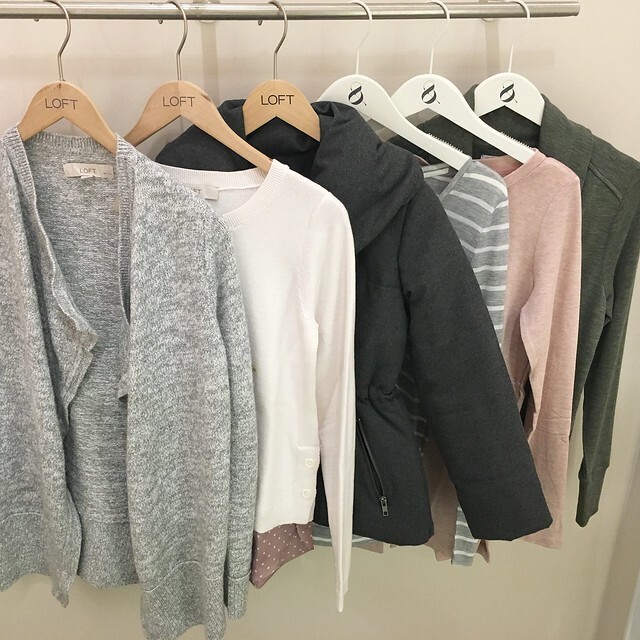 Get 40% off everything at LOFT. Also get 50% off outerwear, winter essentials and layering tees and an extra 40% off sale styles. Valid in stores and online. Since no code is required for this promotion you can use the stackable code CHEER online for an additional 25% off (LOVELOFT cardmembers only) or 20% off (non-cardmembers) full-price purchases of $125+. That’s a total of up to 55-62.5% off (LOVELOFT cardmembers) or 52-60% off (non-cardmembers) full-price styles after online discounts! A few of the new arrivals I wanted recently became available online so I jumped the gun and placed my first order late last night to secure my size. I should have waited to place my order until I had a chance to visit the store but that’s what I get for being click happy. I saw some of the new arrivals in person and tried on a few items tonight and realized that a few of the items from my first order will have to go back due to sizing. I caved in and placed a second order when I came home since I can never tell when size XXS regular will sell out. Once it’s sold out it’s like size XXS regular never existed for a particular item. 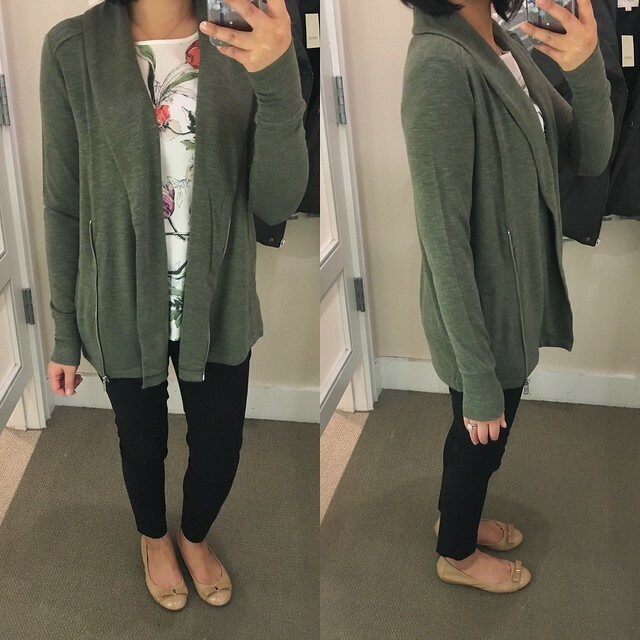 I tried on this Lou & Grey signaturesoft shawl jacket in XS regular. See size S regular on Sara here. 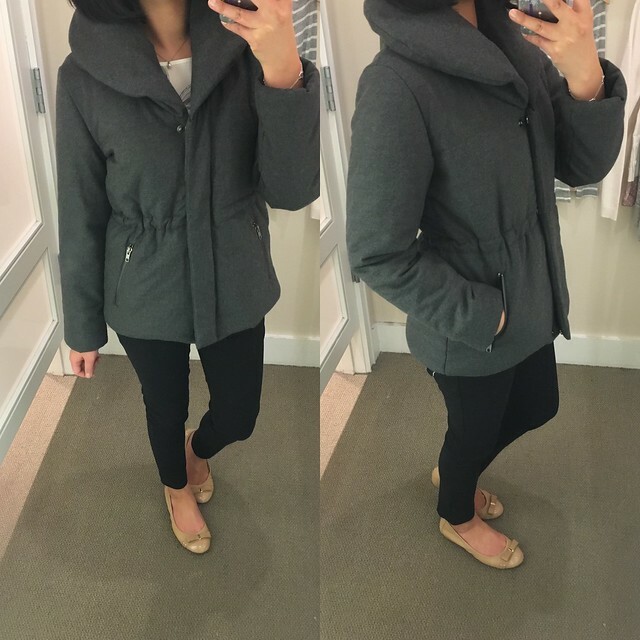 I have this jacket in grey and size XXS regular from last year and the fit and sizing is the same. It’s washed really well (I wash on cold and air dry). You can see last year’s version on me here and here. They added rib trim cuffs to this year’s version on the sleeves and the back hem of this jacket but as you can see the drape of the jacket is the same. I prefer wearing this jacket worn open since I think it doesn’t look very flattering zipped up. The olive melange color was a different shade in person and I wish it was the washed out olive color as pictured online since it would be more versatile in that hue. The jacket does run true to size and I would order this in size XXS regular for a better fit (shorter sleeves) but for now I’ll just stick with the grey one that I already own. I usually regret buying the same thing in multiple colors and always favor one color over the other anyway. This Lou & Grey signaturesoft cack zip tunic is similar to the cowl tunic that I have in XSP (see it on me here and here). It doesn’t come in petites and XS regular was too loose on me so I hope XXS regular will fit me better since I ordered it online to try in pink and the grey speckle colors. 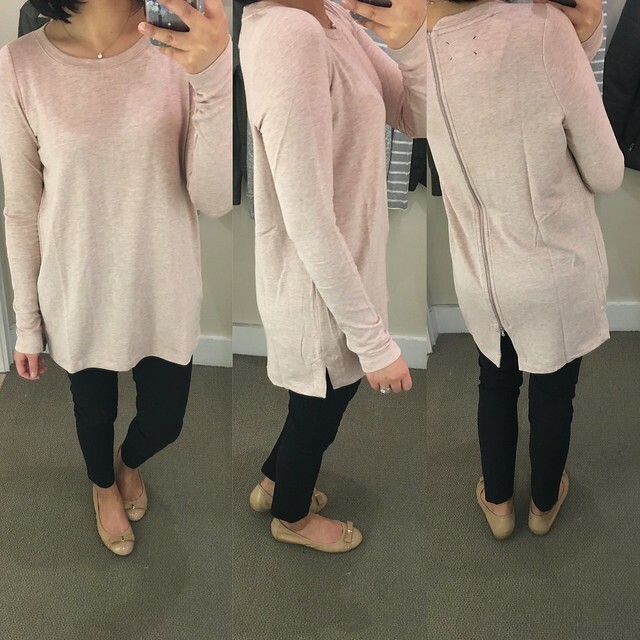 I actually like the longer length and I’m obsessed with the signature soft fabric since it’s cozy and washes well. I’d say this tunic runs true to size with an oversized fit. I ordered this striped softlayer tee in the pink stripe in XXS regular based on the online reviews. 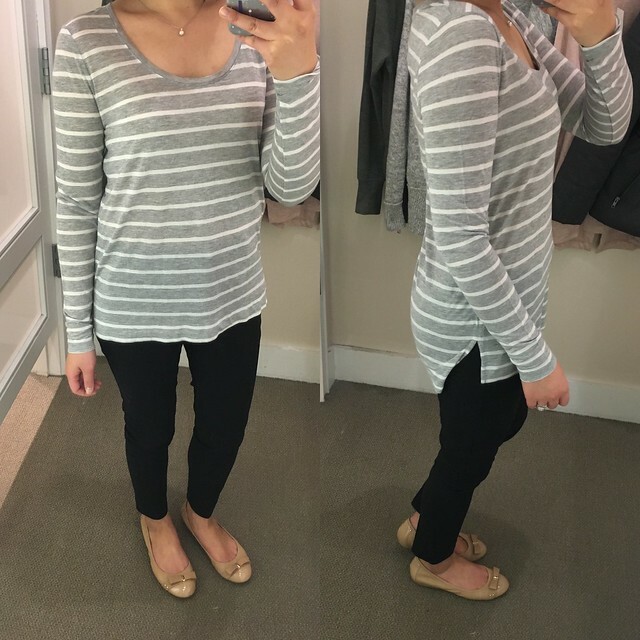 I then tried on XS regular in stores and I liked the looser relaxed fit of XS regular since the material is thin and clingy. I personally don’t like skin tight clothing and I think this top runs true to size if it’s intended to have a relaxed fit. The light grey heather isn’t see through but the pink stripe will definitely require layering a cami underneath since it looks very sheer. I’m drawn to light pink stripes against white so I hope I’ll like it enough to keep it. The pink version was flying off the tables in store while there were more of the grey color left so I was only able to try on XS regular in one color. This dotted two-in-one sweater is absolutely adorable. The polka dot blouse hem is the perfect contrast against the white sweater and I love the button details on the side. 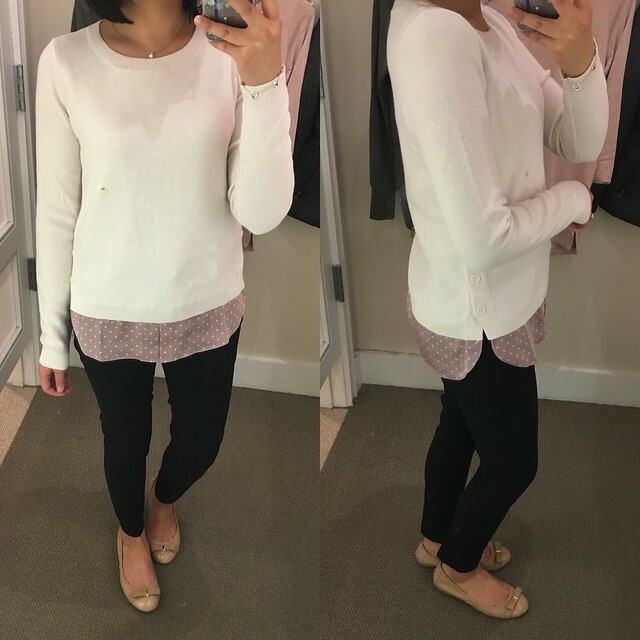 I find that LOFT sweaters tend to be boxy and short in petites so I tried on XS regular which was a relaxed but flattering fit on me. The faux shirttail hem drapes really well. I’m not sure what possessed me to not order this sweater today but I added it to my wishlist for a future order. 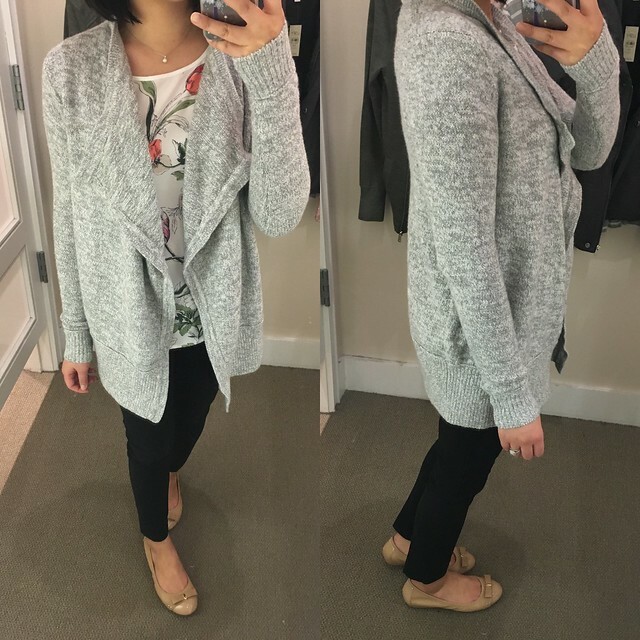 I was able to find size XXSP to try on in this melagne open cardigan but I decided I was over this sweater. See size XSP on me here. This cardigan runs one size larger so size XXSP fits me the best. The sleeves are slightly long but can be folded up and still looks cute. It’s good cardigan to wear if you’re doing some holiday feasting and need to hide your food baby. This shawl collar puffer jacket looks so cute on display so when I saw it in petites tonight I just had to try it on again for size since XS regular was really big. Size XSP hit me at the right length on the hips and the sleeves are even a good length for a winter coat (note that the sleeves look a bit short on me with my arms bent since I don’t usually fit petite sleeve lengths and prefer 23″ sleeves). The waist placement is in the right place for petites but I felt that the jacket sleeves were too puffy and it made me look thick waisted when worn zipped (with the picture taken straight on instead of angling my body) and unzipped. It’s a shame because this jacket is really thick and toasty but I think it will look better on a more slender body types. 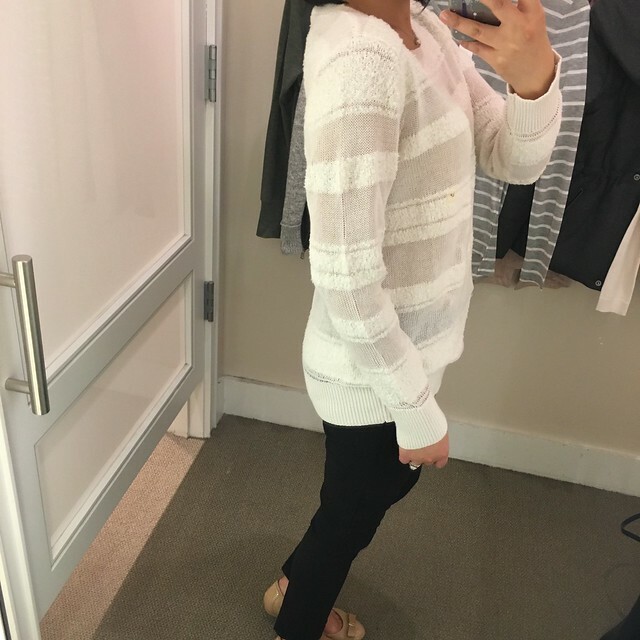 Lastly, I tried on this sheer stripe sweater again but this time I took size large petite and the length and drape was much better than M regular (reviewed here). As I noted before this sweater runs 1-2 sizes smaller so I noticed that the larger sizes were actually almost gone while there were plenty of smaller sizes left on the table. See size L regular on Sara here. I thought I took a picture of the front view but all I have is this side profile.